It is amazing to me how the standard is applied differently amongst our ranks. When a go getter drops the ball he is chastised, while the least contributing person is praised anytime they decide they feel like putting in work this tour. If you are pushing for improvement in your agency and frequently on the business end of lectures, arguments, or retaliation you are probably doing something right! Unfortunately part of being passionate is being held to a different standard. The one tour you decide to take it easy they will notice. The first run you deviate from a policy they will notice. Forget to replace equipment one time they will notice. Miss a little dirt while cleaning they will notice. When you pride yourself on operating to a much higher standard than the status quo, there is little room for error. As frustrating as this double standard may be, it is more of a compliment than anything else. Take the negative with a grain of salt. Those dishing out the abuse are actually disappointed to see you fall even the slightest bit because people like us make up for the placeholders. Aim high and maintain your standard. Work harder every time you deviate. Learn from your mistakes, press on. 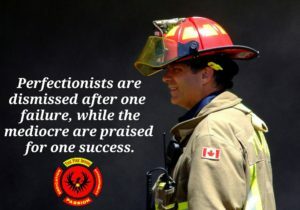 Stop worrying about the mediocre participation trophies; everyone knows the people who are the pulse of the department whether they admit it or not!